As always this past weekend I was undecided about where I should parkrun. In the end, the lure of a trip to Magees for cake following the run was too much and I caved, attending Northampton for parkrun #33. As I had the Dunstable Downs 20m race the following day I wanted to keep things fairly easy and at the start line joked that coming in anywhere between 26 and 30 minutes would be ideal. I hadn’t made it to club for the Thursday night session due to car sharing issues, so when Laura suggested running with me at parkrun for a catchup, this was the perfect solution. You can’t gossip if you are running too fast! In fact, after one mile of running behind a lady she then turned to us and exclaimed “Just how are you able to talk so much whilst running? !” I pointed out that we were both racing later that weekend (Me, Dunstable and Laura an obstacle race that evening) and so were taking things easy that morning. I felt a bit guilty for having used the word easy afterwards though. I must remember the term ‘easy’ is all relative. I barely paid any attention to the course and for once ran on the right hand side of the path. 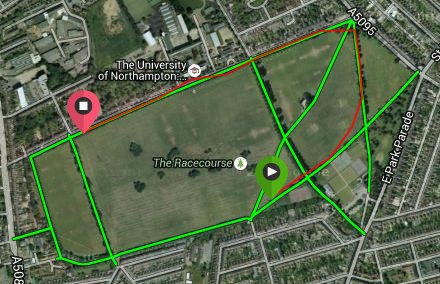 I’m always about the left hand side running at Northampton as the track bends round in a large square shape, with each turn heading to the left. Right as we set off at the beginning of the run I saw a set of keys bounce out of the pocket of the person infront of me. I was in such a flurry of picking them up that I completely didn’t think to remember whose pocket they had flown from and nobody had stopped, obviously not yet realising that they were missing. There was a Toronto-Canada keyring on the keys so I loudly shouted out “Who has lost their keys? !” as I ran, followed by “Who has been to Toronto before? !” It amused a few of the guys running around me at least! A little further on a lady had stopped with a panicked look on her face, anxiously padding down her pockets. I asked her if she had been to Toronto before and luckily, they were her keys! Good dead done for the day! Being called a ‘woman’ was the second time I’d felt old in 24 hours. The afternoon before I had issued a quiz to my year 7 form containing the question ‘What year did the Second World War begin?’ One group answered the question with 1998! When I questioned them as to what year they were born, it was 2003! I felt very old! Laura and I hadn’t intended on running very fast at parkrun and to be honest I was just focused on having a catchup whilst getting an easy 5k in. 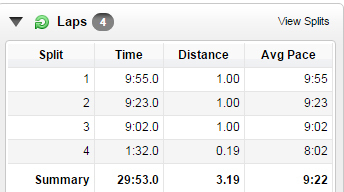 Rather annoyingly, my Garmin lost satellite early on, just before the mile mark. Somehow, by the end it still knew the distance I had ran. Not sure how that works? Perhaps because I have run the course before? The map on my Garmin page had stopped drawing my running line though. The course continues back towards and past the start, turns left and back across the outer square for another ‘half’ lap around the route. When Laura’s watch next beeped I asked “Was that three miles?” without even realising what I was saying. Of course it wasn’t three miles, it was only two. We were still nowhere near the finish! Shows how much I was concentrating on the run! I came across a new blog the other day whilst searching for Northampton parkrun reviews and discovered that the writer of the blog had come up with the #7weeksofparkrun challenge last year. Each week, he had run a parkrun with a name starting with a different letter of the word ‘parkrun’ so that the list of locations in his results table spelt it out. What a great idea! I had given a lift to another friend from my town who is currently returning to running following an operation earlier in the year. Once she had crossed the parkrun finish line a few minutes later all three of us headed to the Magee Street Bakery for hot chocolates and cake. Post parkrun cake is a winner for me on a Saturday morning! Do you treat yourself after a parkrun? Have you ever lost anything from your pockets whilst running? Ever been so busy chatting during a race you completely forgot how far you’ve run?! I love my post-parkrun sticky coffee (slurped on the bus on the way home, with a copy of the local free newspaper). I’m not sure how this is going to pan out with the new house when we move. But, there is a parkrun two miles away, so it is still going to be fine. I love how everyone seems to have a post parkrun ritual each week! 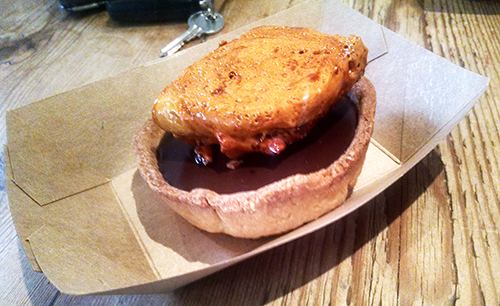 Oh my gawwwwd that tart. We have a little cafe in the park we do parkrun and a bunch of us tend to always go for a coffee afterwards but I never go for the cake. It never looks that good! I tend to stick with my porridge when I get home (I do love it…). But after Saturday’s 20 miler a full-on fry-up was in order! I love having a natter on a run and not realising just how far I’ve gone. Such a nice surprise when you’ve gone further than you though! Never lost anything from my pocket…but I’m always terrified if I wear my hydration belt that when I take something out of it my keys with fly out. Would cause me a bit of an issue getting back into my house! Sounds like you need to find a good cake shop then! 😛 I must admit though, your fry-up looked pretty good last weekend! I’ve not lost anything out of a pocket, but I have once done a run commute where my backpack was open, leading to me rather embarrassingly having to retrace my steps and locate my clothes and bra haha- at least I hadn’t gone too far before I realised. Haha! Whoops! At least you found them before someone else did! Oh my goodness, I need to track down that cake shop! How can I claim to be a Northampton based person who loves cake and has not tried that wonderful little tart? It sound’s like you had a lovely Park Run and it’s wonderful when you just lose yourself whilst chatting and running, it shouldn’t always be about running flat out.. Losing something on my run would be so stressful for me but I did have a near go when I ran mid week, stopped to take a photo at the end and everything flew out of my little running pouch and I was flapping around trying to collect keys etc. It is only one road away from the Racecourse. If you cross at the zebra crossing and head along the main road to the right, take the first left and it is halfway down the road on the right hand side. (Hope that made sense?!) They do a breakfast tart at Magees too if you didn’t want something so sweet quite so early in the morning! My fear is that I will lose something from my running belt when I take a photo as I am forever faffing with my phone whilst out on long runs. Lucky about the keys – well done! I felt old this week when a child asked me if another teacher was my daughter! Do I look old enough now to have a 25 year old child???? Better crack out the anti wrinkle cream! I love a nice breakfast after parkrun- pancakes or french toast are good with me. I do sometimes buy a chai latte from the coffee van, but as it isn’t a sit down cafe or anything it’s not quite the same. Love that parkrun idea- a lot of travelling to make it happen but brilliant! Haha! From the photos I have seen of you, I think it’s pretty safe to say that you don’t look old enough to have a 25 year old child! The beauty of working with children! On days when I return straight home again afterwards, I am a fan of American-style pancakes after a parkrun too. They’re a nice filling weekend-breakfast! It’s a Mcdonalds strawberry thick shake after Parkrun for me. I haven’t been for a few weeks though. I must visit McGee’s. That looks amazing! Yes, definitely hunt out Magees for a post-parkrun treat! I am all about the milkshakes after a weekend run as well. Chocolate for me though!